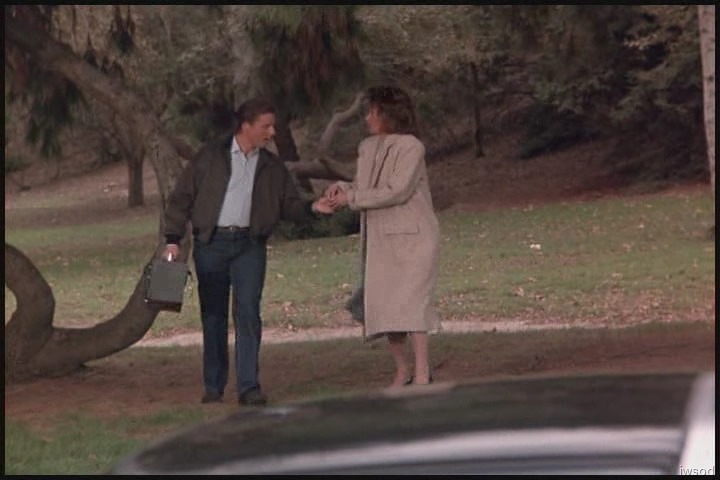 9/19 Season Three, Episode 13: One Bear Dances the Other Doesn’t – Scarecrow and Mrs King | "Just walk with me.."
Hooray! I can finally get on with writing another blog post here.. sorry for the delays everyone! Okay, soooo we left Lee and Amanda sneaking closer to Dotty and Zernoff with their boom box taping Dotty and Zernoff’s conversation Is it just me who finds Lee carrying that boom box with the headphones hilarious?! 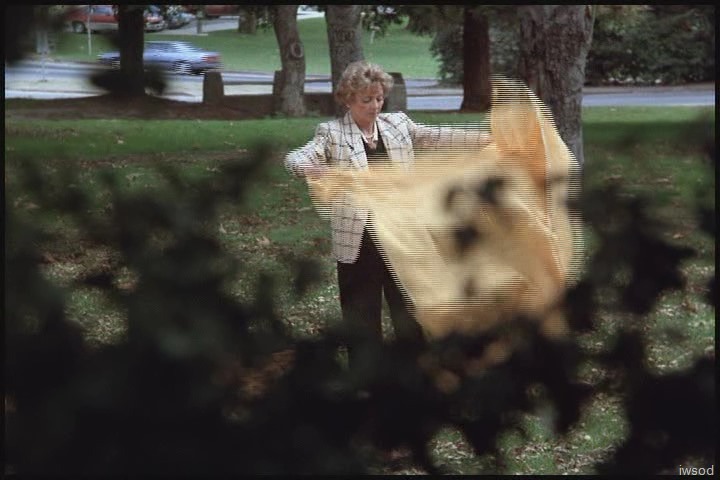 So… we cut to a view of Dotty spreading out the blanket on the grass.. She’s alone.. uh oh..
We cut to Lee and Amanda sneaking closer to Dotty..
lol very suspicious looking! tee hee..
(Lee takes off his headphones and gives them to Amanda. 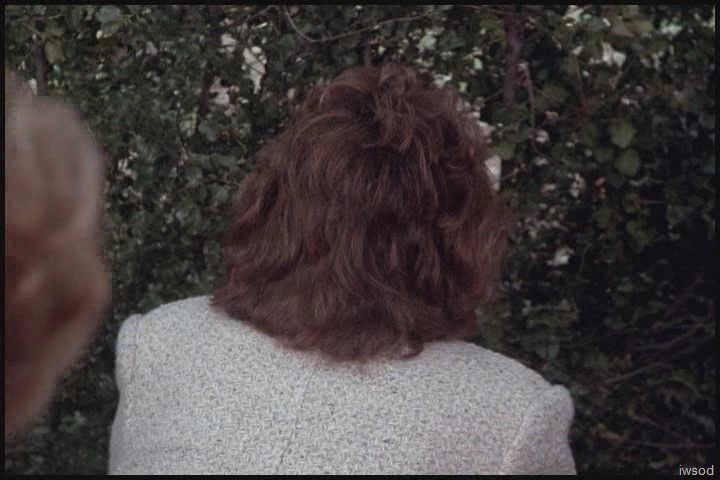 Dotty hears a sound in the bushes- I think it’s Amanda putting the boom box down. Dotty reaches out and taps Amanda on the back to get her attention. Amanda plays along and smiles.. The look on Amanda’s face as she watches her mother leave? Flippin hilarious!!!! I can almost hear the nervous laughter bubbling up from her.. gah!!! Love the final expression as Amanda turns back around.. Whooo I kinda got busted! Rofl – Did Dotty not notice Amanda had a boom box and headphones?! tee hee.. No thought for how the heck Amanda got herself to the park to follow her?! ROFL at how there’s no need for Amanda to respond!! Dotty just fills in the blanks all by herself whaaha…2+2=5! And in this instance: thank goodness! Rofl! If Dotty hadn’t what would Amanda say? Is this not one of the funniest Amanda and Dotty moments so far??!!! I think so! I never fail to laugh at this – both KJ and BG are hilarious in this scene!!! 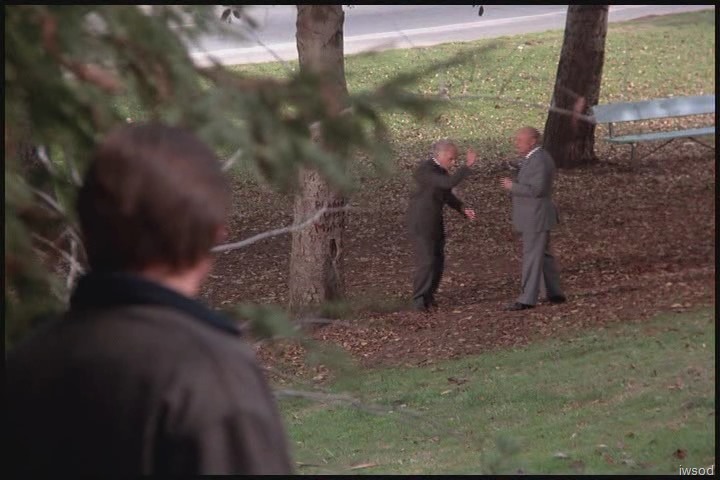 We cut to Lee in the bushes watching Zernoff arguing in Russian with a man. 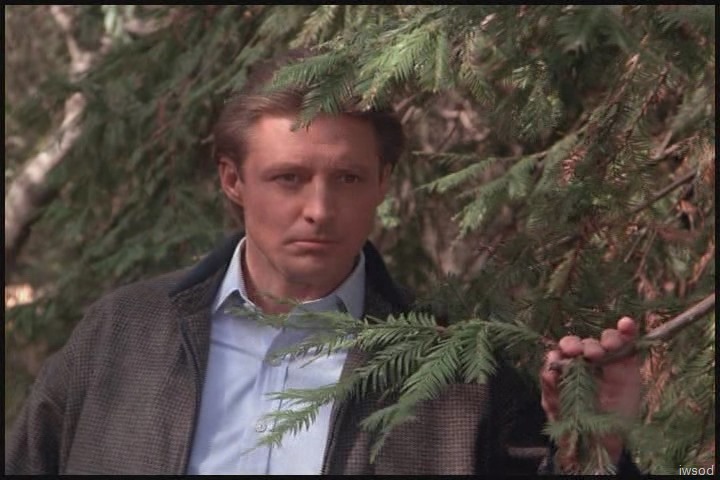 Oh my.. Lee in the shrubbery – he’s lookin good!!! What they’re saying is muffled…but clearly Russian. (funny when earlier their phone conversation was in English!) … The body language says it all they’re not happy! Zernoff storms away angrily. Lee re-joins Amanda as they head back to the corvette..
Lee: We’d better follow them huh? …You think you can handle it? Amanda: Yeah, Mother only makes right turns. Lee: OK I’m going to go back to the Agency and get another car. I just called Francine, seems my informant Jerry wants to see me again immediately. 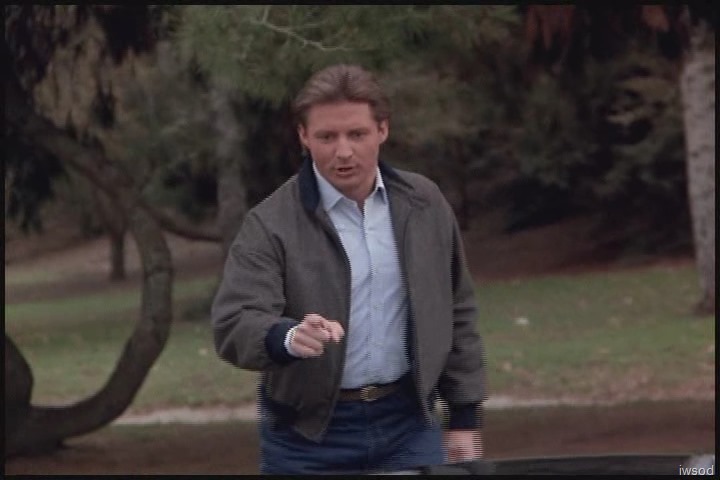 Amanda drives off and the scene ends. I’ll finish up here for the moment – can’t wait to share this hilarious scene with you all and hear your thoughts! byeee everyone – thanks for reading! Quickly, before I read anyone else’s comments. Lee says, “Take THE car”. Not “take MY car.” I find that interesting. And I bet that Amanda is so happy that 2+2=5 for Dotty. I love her facial expressions during that. What does Dotty think Amanda is up to? Yes, very interesting that he uses “the” instead of “my” for the car. I commented on something Amanda said in a similar fashion in a later post…hmmmm…. 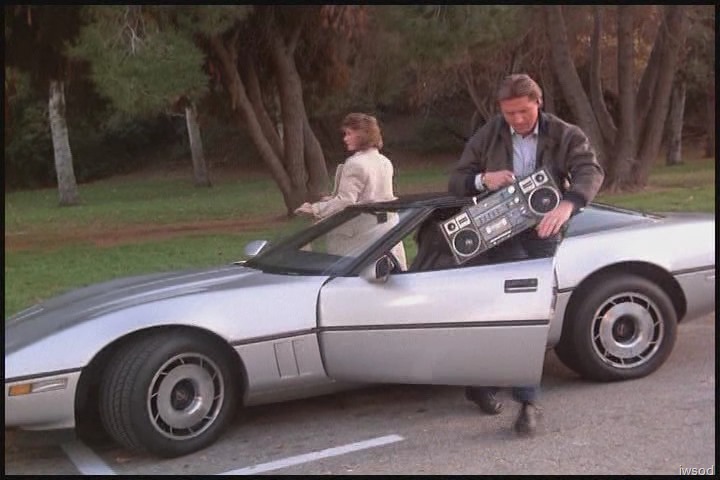 You would think that they could have found a smaller boombox given how difficult it was for Lee to get out of the car with it. Where was it while they were in the car? It’s not like there was a ton of space in there for it. Yeah, but without the humongous hair on Dotty! ROFL! And I think there is nothing going through Amanda’s mind there…zip, zero, zilch (sorry, Count). That is why she has such a blank look on her face. I think she can’t believe her mother has caught her! 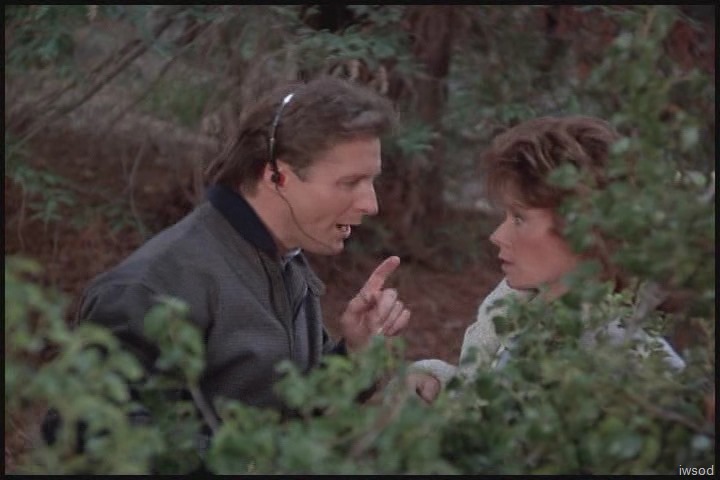 And if Dotty had caught Amanda with Lee, would she have made the connection to Mr. Sampson? Perhaps Amanda or Lee would have brought that out as an excuse. Lee does look good in shrubbery, but I think he is at his best in casual blue. Not sure if it’s up there now or not, but that ALLA banner at the top from where he brings the pizza to Amanda’s door is just gorgeous! I love Lee’s look head to toe in that one! I’m totally confused by who is the baddie, who is the semi-baddie, who is the goodie and who is the leak (and if the leak is a goodie or baddie) in this episode, but the Dotty/Amanda exchanges and the brilliant facial expressions by BG and KJ make this an episode I go back to again and again. Agree, Learjet – love that we get to see lots of Dotty in this one. BG was a great actress and I thoroughly enjoy her in this episode! And one more thing – I think Dotty is a reminder to Amanda and to all of us to sometimes not take ourselves too seriously. She is the “anti-Agency” force for SMK! 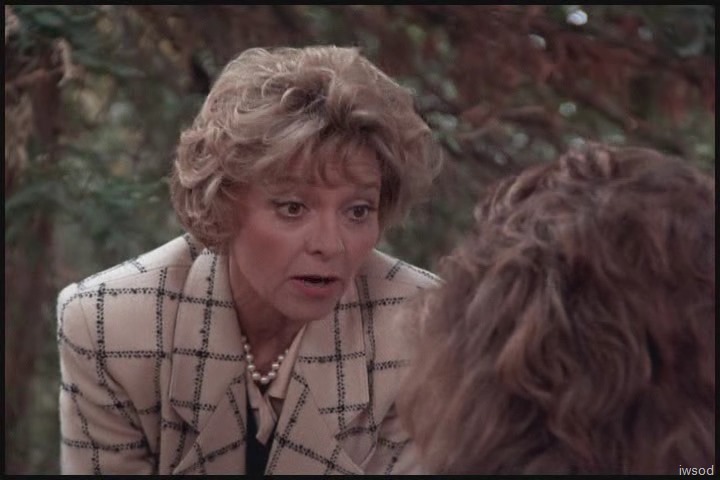 I like how Dotty assumes that she knows the reason why Amanda is there in the park. It’s just like how she assumes that a lot of Amanda’s strange behavior is to cover up for love affairs. When Dotty gets an idea (or sometimes a set of possibilities, like her multiple theories like in Agatha Christie stories 😉 ) in her head, she tends to stick to the most likely explanation (to her) and ignore anything else that would complicate it. 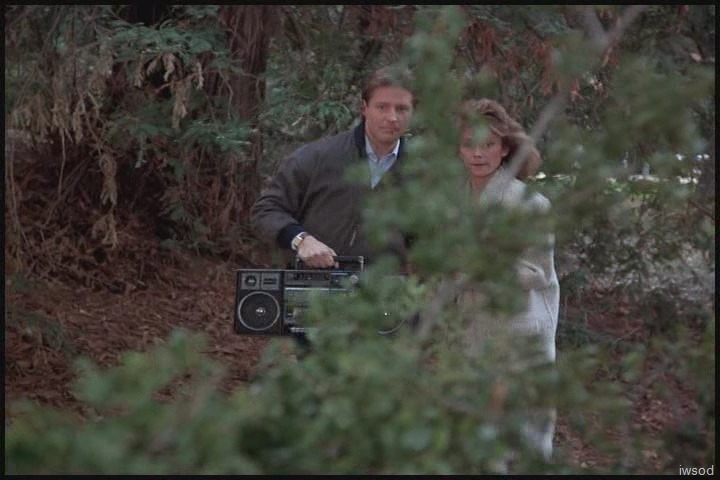 Whether she noticed Amanda’s boom box or not, she seems to consider it a trivial detail compared to what she thinks the bigger issue is: that Amanda is concerned about her romantic life and that Amanda should realize that she can handle her own affairs. As far as these extra, trivial details or oddities are concerned, I think that they don’t matter much in Dotty’s mind because I don’t think that Dotty expects life or people to make perfect sense. My theory is that Dotty is accustomed to oddities and eccentric behavior and therefore tends to ignore them in favor of what she thinks is more important, not bothering to try to connect all the dots to see the bigger picture. I’ve been pondering this scene.. to me it’s hilarious yes.. but underneath the hilarity, it’s IMHO a big moment for Amanda. Do you think this experience will impact on Amanda now and into the future? If so.. how? no one has responded to this so I’ll just finish my thoughts here – I’m thinking this could be a very liberating moment for Amanda.. She’s faced her worst fear when it comes to Dotty – and found it was fine.. Dotty will never understand what’s going on anyway! bye for now and hope you are all well! I was just going to comment about this in the next post and was playing catch up and came across this. I agree, sort of. I think I go back to the new post and comment further if that’s okay. Anything is okay Valerie 🙂 however you like! 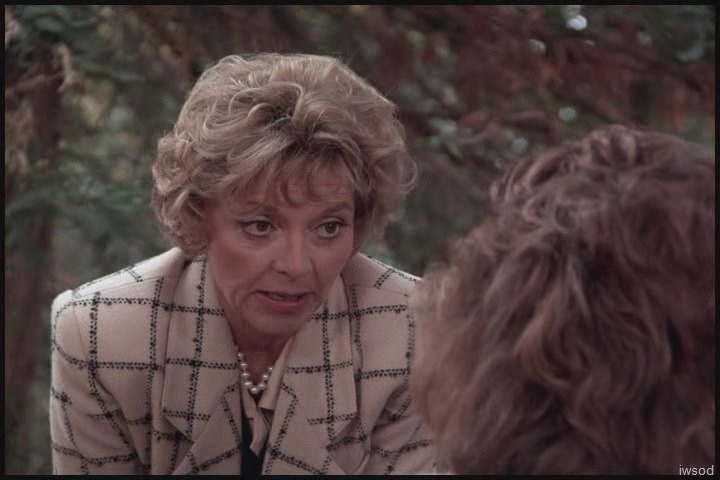 I also reminds me of Playing Possum when Amanda tells Dotty the truth and she thinks Amanda is telling tall tales. But really, why would Dotty even be able to explain Amanda’s actions with the idea that her daughter has become a spy. As fantastical as Dotty’s imaginings are, she can’t put her real life daughter into those scenarios. Maybe that was part of what Amanda had to overcome for herself (thinking of SAAB). But, I agree Iwsod, this has got to be liberating for Amanda. I am thinking that in this episode Lee comes to terms with Amanda’s relationship with Dotty and so does Amanda, in this” professional life careening into real life” sense. I agree, Morley. We would have to question Dotty’s sanity if she jumped to the conclusion that Amanda was a semi-professional spy! And Dotty’s head was in fantasyland at the time so I doubt she was inclined to do any deep thinking past her immediate circumstances. I do love how the SMK writers framed this moment. KJ is brilliant … you can truly read her mind (“oh no, busted”) in the expression on her face. This immediately after mother showed up at the safe house unannounced had to really get Amanda into panic mode. She is really going to blow the agency’s investigation (even if it’s through no fault of her own!). Too funny! I also enjoy seeing the efforts that our SMK writers go to in order to keep Lee and Dotty from meeting! Smiling as I think ahead in this episode …. dum de dum de dum. Like this, Jestress! Dotty is happiest when trying not to make sense of everything! It fits her perfectly! And is something to which I cannot at all relate – hahaha 😆 But I so enjoy her! Meanwhile, I am not loving those jeans on Lee. Normally he looks smokin’ hot in jeans (even 1980’s jeans) but these ones are just not doing it for me. Love that Lee trusts Amanda with the ‘vette. Can’t figure how only right turns would be easier, especially if you’re steering from the left hand side of the car. Well, with right turns you have to check only in one direction – to your left – whether there are any cars coming. At least when you’re driving in the USA or most European countries. That’s because you drive on the right side of the road. In Great Britain, New Zealand, Australia and every other country where you’re driving in the left side of the road, left turns would be easier (since you only have to check to the right whether there’s other cars coming). Khell’s right about the right turns. When making left turns, you also have to make sure you have the light (if there is one at that intersection) as well as an opening in traffic. It’s possible to turn right on a red light at most intersections (as long as there’s an opening in traffic, and there’s no sign to say it’s prohibited) because it would go with the natural flow of traffic. Therefore, beginning drivers or nervous drivers prefer making right turns instead of left whenever possible because there’s less to check and therefore less risk of an accident. Dotty hasn’t been driving for long and is still nervous about it, so she’s trying to make it easier on herself, even if it means driving in a circle before eventually heading in the direction she really wants to go. If people drive on the left side of the road where you live, it would be similar to making a left turn instead of a right. yeah I figured it was about turning across incoming traffic.. A 5 minute trip for Dotty must take half an hour lol.. think of all the fuel she uses! eek! I drove when I lived in the US for a year.. and it didn’t take much getting use to.. the only situation that would occasionally throw me was driving down one way streets.. I get confused by one-ways too. I think they should be banned. We’re now visiting my sis in your neck of the woods, ISWOD and she laughs every time we get in the driver’s side of the car thinking we’re going to be the passenger. We haven’t driven here, but crossing the roads as a pedestrian and checking for on coming traffic has been very entertaining. Of course, here in Michigan you would have to deal with what we call “Michigan Lefts”. In some places you can’t make a left turn. It’s usually where there is a median of a grassy nature. You have to make a U-turn on the left side at a designated area and then get over to the right and make a right turn. It sounds odd, but I’m so used to it I don’t think about it anymore.. I do get stuck in the roundabouts though. Not liking those jeans either. Amanda’s bulky coat is not that great either. And it’s definitely the wrong color to be skulking around in the bushes. If Dotty hadn’t heard her she probably would have seen that coat not blending in too well. This was a better jeans moment! I don’t like the colour of these jeans (a bit stodgy) but they are a bit snugger than the pizza jeans (a good thing IMHO 😉 ) Agree with Valerie about Amanda’s coat/jacket. But I do like both L & A’s hair in this scene. True.. the coat is bulky.. maybe it’s the length that contributes to the chunkiness.. the one she wore that was shorter last week was much better..
Agree – with you on those jeans – the pocket design on them makes me think they are cheapo knock-offs. Not that Lee jeans are expensive, but these came from the bargain bin and do nothing for him.